Phenomena are interconnected regardless of distance, in a holistic ocean more voodoo than Newton. The risk with multi-protagonist novels is that one (or more) of the characters lacks something that the others have, that their stories are not of equal quality. Well, there’s no danger of that here. The nine stories take us around the world, from the Orient and Mongolia to Petersburg, then Ireland, London and New York. Each has vitality, linkages, humour, and tragedy. 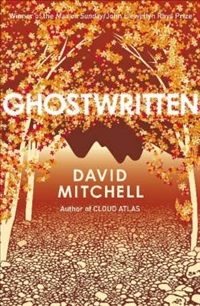 Mitchell’s fascination with interconnectedness extends beyond this book too – with characters showing up in more than one book. One of the things he said with regard to this practice was that he does it in part to amuse himself. One of the joys of this book for us readers is that we can see those moments and share in them. This extends from the more obvious questions of how does one character fit in another’s story, down through ‘mid-level’ recurrences such as notions of physics, and all the way to motifs which reappear, such as camphor trees, comets, quasars or Kilmagoon whiskey. As a reader, part of the fun is in those moments of frisson when you become aware or spot another link. It’s really hard to pick the best of them. Even the Mongolia chapter, which seemed to sag ever so slightly in the middle, came with such a kick ending that you soon forget any quibbles. I loved the ‘Clear Island’ chapter, the story of quantum physicist Mo Muntervary, whose brilliant technology has found its way into smart bombs. She tries to resign but the firm she works for won’t let her. She goes on the run, escaping back to the island off the coast of west Ireland where she was born and raised. The way things end up for Mo is spellbinding. ‘Night Train’, the final of the nine stories, (before a short capstone chapter), is hilarious, with the mysterious caller to Bat Segundo’s late night radio show in New York. The way Bat assists ‘Zookeeper’ as the person calls themselves in deciding what to do with the animals in the zoo is breathtaking. AS Byatt proclaimed Ghostwritten to be “the best first novel I have ever read.” High praise and warranted. If you haven’t read it yet, make a bee-line for it. David Mitchell at his best. Superb. …that it’s a story about the end of the world. Timothy Cavendish, Marco’s publisher, is a main character in Cloud Atlas, so it simply didn’t occur to me that it was possible. When the Zookeeper reaches his decision at the end of Night Train, I assumed he meant he had decided to intervene in humanity in a limited manner. He’s actually decided to destroy the human race, and I can’t believe I missed that. I would also recommend number9dream (http://en.wikipedia.org/wiki/Number9dream), a surreal, funny cyberpunk quest for a lost father in Japan. This novel, together with Ghostwritten, were my introduction to Mitchell in the late 1990s. They’re both interesting books. Thanks, John. It’s on my TBR list along with Cloud Atlas. Cheers, John. So many books. Such little time! about the Clear Island part, do you think the name of the pub (The Green Man) is a tribute to Kingsley Amis ??? + what about that Kilmagoon whiskey ?? any hidden meaning ??? Hi Anna, welcome. You could well be onto something there with the Green Man. It’s quite a common pub name in Britain, but given Amis’s part ‘ghost’ story of the same name, I think it smells of something more than coincidence! I’m not sure about the Kilmagoon angle, though. What’s the connection? Cheers, John.